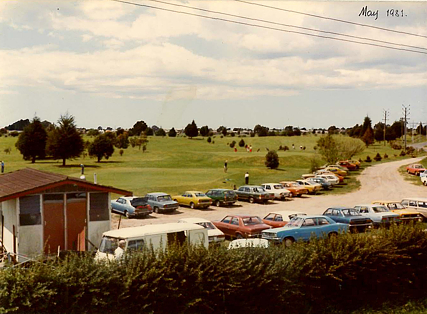 In the 1960's the Mt Maunganui Borough Council acquired an area of land at the corner of Matapihi Road and the railway with the intention to use it for multi sports activities. However, due to the proximity of the airport it was considered that the area might be more suitable for development as a golf course. In 1969 a then noted golf course designer, Mr H. P. Dale was engaged to prepare a number of plans and layouts. Late in 1970 the Council advertised the availability of the land and layout plans to any group of golfers prepared to form a club and proceed with construction. Interestingly enough, none of these people had a direct interest in golf or any intention of playing, so the club was very much indebted to them. When the decision was made a public tirade of correspondence was launced by the residents of Arataki as they believed the land suggested for the Club had been set aside for children's parks etc. One of the reasons given for a golf club on this area was that should an aircraft get into difficulties upon take-off or landing there would be less lives lost. It appears that golfers are seen to be more expendable than other sports persons. Due largely to the supervision of Harry Dale and the untiring efforts of a number of volunteers the earthworks and course formation was completed well under budget and in record time. On the 12th of April, 1972 the course was officially opened with 120 members and only 10 holes.. Unfortunately, due to the harsh summers and lack of winter rain the course playing surface suffered as the grass was burnt off leaving the hardy weeds to take over and on one occasion a resowing was required. 1974 saw the purchase of the first Clubhouse; a two storey house owned by the airport which was transported down from the paddocks behind. In 1975 major course changes were undertaken A small par three into the eastern corner was eliminated and the par 5, 13th introduced. 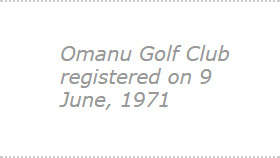 The Omanu Classic was first held in 1977. The members of the 1992 winning Eisenhower Cup; Philip Tataurangi, David Scarhill, Michael Campbell and Grant Moorhead all played in the Classic with Tataurangi winning in 1992. James Hamilton was the first Omanu member to win on home soil in 2011. 1977 also saw the construction of the new clubrooms begin. This was significantly upgraded in 2003. The appointment of the first Secretary/ Manager, Mr Owen Jones was made in 1981. Prior to this Presidents and Captains carried out most administration functions as well as running competitions. This was followed by the appointment of the first Club Professional, Mr Alan Snape, who apart from a short break was the Club Pro until his passing in 2009. He was followed byGolf Fit, a team lead by Brent McKay. 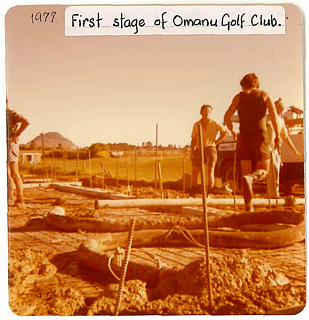 Omanu Golf club became one of the first Clubs in New Zealand to adopt the Board structure in 1990, with committees reporting to the Manager and onto the Board. A famous cabbage tree used to be situated 100m from the green in the centre of the 6th fairway. This was the bane of many approach shots, but in 1992 the tree died in mysterious circumstances. The only record of the tree is a painting done by a member. The painting now hangs in the Bar. The Club was approached by a developer to build 60 lifestyle units including bowling greens on the 10th fairway in 1993. However, as the Club could not obtain further land to construct another fairway the financial carrot did not stack up and the offer was turned down. In 1994 full course irrigation was installed which saw the club progress in leaps and bounds to the wonderful facility that we enjoy today. Initially treated waste water was used with Omanu being the first Club to utilise such a scheme. Unfortunately the Council could not continue tio meet the resource consent requirements and bores replaced the treated water in 2005. New green keeping sheds were erected in 1994. Prior to this course equipment was for many years stored in an old barn lent to the Club by a Famer across Matapihi Rd. The Driving Range faciity was built in 1996 by local business people with the lease providing a revenue source for the Club. By 1998 the Airport decided it needed to extend the runway to accomodate larger planes. The consequence to the Club was the development of the Tree Management Plan which has strict criteria on the height of all trees on the course. As a consequence regular pruning, removal and replacement takes place today. The initial cull, however saw the removal of 127 trees. The 7th gully to the drain was battered in 2000 with financial assitance from the council. Prior to this the sides were near vertical and if a wayward shot went in the drain, the ball was nigh on retrievable. The 2003 remodelling of the clubhouse cost $700,000 and even after extending the loan a few years, this will be entirely paid for by 2015. Major floods in 2005 and 2011 enhanced many members opinions that water features would be an added addition to Omanu, however the proximity to the airport and the possibility of bird strike on aircraft has seen the Airport turn down any request.